/ Modified aug 24, 2018 4:50 p.m.
Gov. 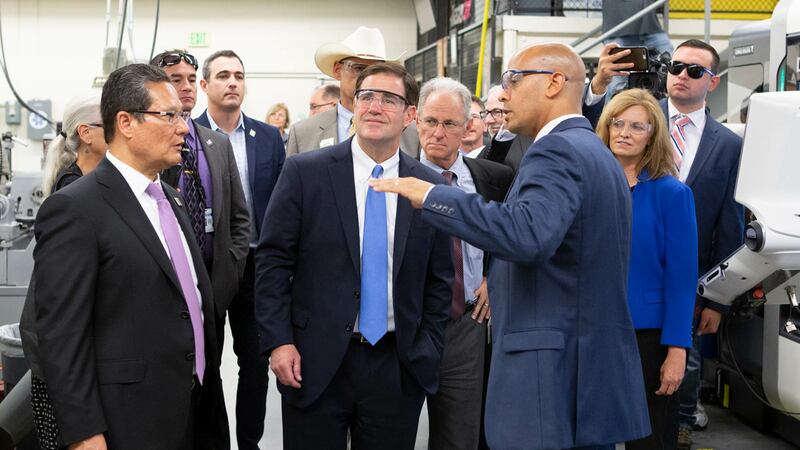 Doug Ducey tours Pima Community College's downtown campus as part of a Caterpillar announcement, Aug. 24, 2018. From left, Lee Lambert, PCC Chancellor; Ducey; Greg Wilson, PCC academic dean of business, occupational and professional programs; and Jean Savage, vice president for Caterpillar’s surface mining and technology division. Pima Community College officials today (Friday) launched a new partnership with Caterpillar. The industrial equipment maker will send 24 of its engineers through courses at Pima to gain hands-on experience with welding and machining. Caterpillar vice-president Jean Savage says the program is exclusive to her company, for the first year. "We've got employees already working for the company who we want to expand their skill set give them better understanding. In the future I think you can help with high schoolers coming out who want to get into the trades, to set that basis and they're going to know how to come in and do the job that we need them to do," she said. The move comes as Pima is preparing to build a Center of Excellence in Applied Technology at its downtown campus. The center will include a manufacturing floor, to give students experience in a factory environment.